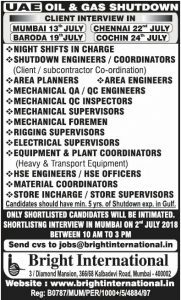 SHUTDOWN INTERVIEW IN MUMBAI ON AT Anuptech, R-421, MIOC, Rabale, Navi Mumbai – 400701.CANDIDATES WITH MIN. 5 SHUTDOWN EXP. ONLY APPLY EX- TAKREER / GCON PREFERRED SUNDAY OPEN. Candidates must have min 5-10 yrs exp. of Commissioning. Please reply me for shutdown jobs. I am urgently looking for a job. if there is vacancy u can contact me on irfan.pathanb@gmail.com in my mail id. 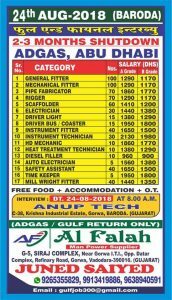 I am looking ndt inspector or ndt technician job in gulf for shutdown pl inform me i have more than 15 years experience in ndt field from india nad abroad. 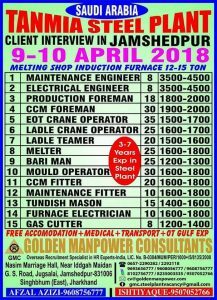 I have 11 years of experience in NDT (RT, LPT, X-ray, Asst P.W.H.T. & Asst site incherge) Technician field and I would like you to consider my candidature. Sir, I have 23 years experience in catering ( Industrial ) as senior catering supervisor / Area Manager. I would like yo consider my candidature. 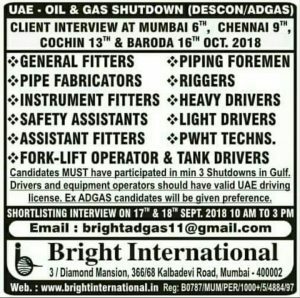 I have 17 years in India & 7 years gulf Experience in mechanical I am 50 years old. 18+ years’ experience in the field of NDT Inspection activities in Gas plants, Refineries, off shore installations, Petro chemical plants, Vessels, Rigs, Cross-country pipelines. I am looking for a shutdown job 2-3 month. I require a job as in civil construction site supervisor/ qc inspector, having 3 years of experience in this relevent field.